Yoga Gurukul (University of Yoga) in Nasik, India. Yoga Chaitanya Seva Pratishthan - A trust to help propagation of Yoga in remote part of India. Expanded the network of Yoga Vidya Dham to more than 100 cities in India. Successfully treated more than 13000 patients suffering from various diseases in our Therapy centre. Presented more than 15 research papers in different International Yoga Conferences. Beneficiaries more than 2,51,700 in last 20 years. Established in 1979 by Mr.Vishwas Vasant Mandlik, at Nasik. Yoga Vidya Dham is a University which imparts Yoga training to students and those aspiring to be yoga teachers. Yoga Vidya Dham runs a well equipped Yoga & Naturapathy treatment center. Thousands of people work honorary at Yoga Vidya Dham to support this great yoga movement. Courses are conducted at different levels, Yoga Bindu, Yoga Sopan, Yoga Pravesh, Yoga Parichay, Yoga Praveen, Yoga Pandit, Yoga Teacher, Yoga Adhyapak and Yoga Pradhyapak. An exclusive curriculum is designed for students of all age groups. Separate syllabus for those suffering from different health problems and diseases. Courses for Professionals are also conducted there. 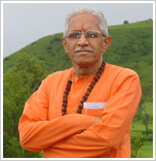 Born in 1944 in the holy city of Nasik, he completed his education from Pune. In 1967 he graduated from University of Pune as Bachelor in Electrical engineering from Government College of Engineering Pune, one of the oldest technical schools in India. During the college days, he won lot of awards on national level in competitive rowing, boating. He also won the prestigious "Senior Championship" in 1966. Yogacharya started his career as a Engineer in Voltas Transformers Ltd., a Multinational Company in Pune. After working there for 12 years eventually he started his own business of Manufacturing Electrical Distribution Transformers and Industrial Equipments in Nasik in 1978, expanding to Pune and Aurangabad in next few years. While he was looking after his business, he started Yoga Vidya Dham in 1978, utilizing the morning and evening hours for the noble cause of Yoga Education. He retired from his business in 1995, adopting Yoga Education as his life mission. Today Yoga Vidya Dham is one of the big yoga institutes in India, working as a Non Profit Organization having 150 branches in Maharashtra alone, 8 in Karnataka, 7 in Eastern part of India and now expanding in other countries like US, UK, Italy, Hong Kong, Australia, Ireland etc. More than 250,000 people have completed basic Yoga Pravesh course till today. More than 8500 teachers work all over India conducting classes. He has authored more than 18 books and over 50 audio cassettes, 2 software on Yoga Education, applications of Yoga, Yoga as a Therapy, Yoga for Kids, Women etc. He is the Editor of Yoga monthly called "Yoga Sugandha" for last 25 years. He is Vice Chancellor of Yoga Vidya Gurukul (Yoga University). He has treated more than 13500 patients suffering from various chronic diseases like Back ache, spondilitis, asthma, diabetes, heart problems, arthritis, hypertension, blood pressure, digestive disorders, psychosomatic disorders and many more through Yoga therapy centers in Nasik and other cities. Today Yoga Vidya Dham successfully running 2 centers in Nasik alone. Today he conducts various courses, lectures, workshops on stress management, therapy etc all over India. He has been the source of inspiration to thousands of yoga seekers, volunteers, teachers all over India and other countries as well. He has received many awards in last 30 years, most prominent of them are "Outstanding Citizen award", "Lifetime Achievement Award" by College of Engineering Pune, prestigious "Saraswati Award" by Kailas Math Nasik, "Ideal Yoga Teacher" etc. The true recognition of his work came when Paramacharya (Chancellor) of Bihar Yoga Bharati (First Yoga University in the World) Paramhansa Niranjananda Saraswati honored him with the title "Yogacharya" means Best Yoga Teacher or Guru of Yoga. On 6 th march 2007, Paramhansa Niranjananda Saraswati of Bihar Yoga, initiated him to Rushi Sannayasa (part of higher sannayasa tradition) and gave new name "Rushi Dharmajyoti".